Classic Brownstone Garden Apartment is on the garden level, entering into your own lobby area, with double doors heading directly into the living room, where, it has 2 queen size sofa beds which sleeps 4 people very comfortable. Moving on you will find, the open plan kitchen with bar stools for entertaining, microwave, toaster, coffee maker dishwasher, fridge/freezer, along with pots/pans, utensils, and cutlery. The bedroom looks onto the garden with Queen size bed ( English king) double closets with mirrors, side table, reading chair, and lamp. Extra linen and quilts for chilly nights. The bathroom has a bath/shower, towels, blow-dryer. Last but not least, the laundry room with full size washer, and full size dryer. The garden is occupied by the owner, but you can certainly sit outside with your coffee whenever you choose. The Neighbourhood: You will find lots to see and do, if you like the old, mixed in with the new. The area has changed over the last 20 years, but if you look closely, some of our period homes have remained the same with stunning 1900 details, and charm. Many of our locals have lived in the neighbourhood for most of their lives, and take a tremendous amount of pride. Wonderful things are coming, from restaurants, Manny's, my favorite spot for breakfast/coffee/lunch, and dinner, nice and local, just a 5 minute walk. Popping up, even more quaint and wine bars, coffee shops, all within walking distance or a short trip on the A train...Yes the 'A' Train travelled by Duke Ellington, and not forgetting Lena Horn who would belt her tune in her local church community. Transportation: With a 10 minute walk towards Fulton Street/ Utica Avenue you will find the local subway A or C train. Or just a short walk you have the J or Z train at Gates Ave heading into the city with the over ground view of the city. Which can be refreshing for those that want a glimpse of NY. The 'A' train (Express) skips all local stations into Manhattan takes 12 minutes to Lower Manhattan - World Trade Center, Wall Street, Statue of Liberty, Ellis Island, Staten Island Ferry. If you stay on the train, you may head to Midtown - 34th street, 5th Avenue, 42nd Street. All this is another 10 minutes. on the same express A train. Of course if you grab a map, you can discover much much more. This is the city that never sleeps after all!!! I was born in London, and have lived in the US for over 25 years, its just an amazing place to live and visit. Living in Brooklyn allows me to have the best of both worlds, Manhattan for the hussle and bustle, then the peace of tranquility of our diverse neighborhooods. I love to entertain friends, and family you name it, but best of all bringing a touch of home comforts to my many travellers passing my way! When it's my turn I love to head out of town to see family and friends, for some well deserved relaxation. I wanted to find a home that had a true neighborhood, and community feel and vibe. Kids laughter in the summer sun, riding bikes, jumping ropes, while mums and dads sit on their stoops relaxing watching them play. Neighbors here are friendly, with a 'hello ' or a 'Good Morning'. while you hussle along your way to work, or school, or just stopping to have a chat. Autumn brings a cool change, savoring the evening breeze before the winter sets in, all the while getting many 'how was your day' from our lovely seniors who make a tremendous difference to keeping our block a vibrant place to live. A true Classic Brownstone, with old world charm and modern twists. Our home provides that, from the 1910 iron bars on windows, to the front gates all orginal to the home, to wood detailing features, pocket doors crown mouldings on the palor floor. A tree lined block where many homes are proudly showed off during summer/autumn house tours. Historic charm is what you will find on many blocks. Modern has it place too, which is what makes this neighborhood a charm. No smoking. No pets. Be respectful to your neighbours when entering/leaving the apartment. No loud music or parties permitted. No unauthorised guest without prior knowledge/consent from the host. Avoid leaving lights on when leaving the apartment during the day and last thing at night. Make sure all windows/doors are closed securely. Dispose of any unwanted items in the garbage (Sun, Tue, Thursday). NYC recycles, so please dispose of glass, plastic, paper, etc., separate from regular garbage. We would appreciate it if no outside shoes are worn in the apartment, slippers/flip flops are expectable. My husband and I were very comfortable at Judith's Homeaway! She gave us all the help we asked for and made us feel welcome like family. Quiet neighborhood. The apartment was large, clean and a short walk to the subway. Had a great time. The property was ideal for what we were looking for with easy access to Manhattan . We had a great time the property suited our needs as we wanted a base to move around,Judith and Ralph were first class their if you needed them when we arrived the lock on our case was broken and Ralph was down with his tools to help,Judith was great with local knowledge etc the area is perfectly safe and the local people are so friendly. We would certainly go back thanks again Judith for looking after us with taxi's etc David our driver was great but tell him he should put his prices up,he also had great conversation.all in great trip thanks again. Great apartment in a lovely neighborhood. Bed was very comfortable with a selection of pillows to choose from. Kitchen had everything you would need, towels big and fluffy. My friend said the sofa bed was very comfortable. Felt very safe walking in the neighbor and to the subway. Judith was very nice and steered us in the right direction for breakfast. Cafe Ralph and Manny’s were great. I would definitely recommend this apartment and would love to stay again should I ever go back to New York. We (2 adults & 3 kids) stayed for 4 nights in August 2018. The apartment has everything you need, can accomodate 6, looks nice, is very quiet, safe and clean. Washing machine, dryer & dishwasher are a big plus. Judith was very nice & let us do a late checkout the day we left. We would just suggest to add a couple of folding chairs as there are only 4 stools to sit on for meals. it was a pleasure to host you and your family. Sorry we forgot to bring down the extra seating. So pleased to hear you all had a good time. Thank you for taking good care of our home. My family (myself, husband & 3 teenage sons) stayed here for a full week in July. The living room with the pullout sofas were perfect for our boys to have their own separate space. There were pocket doors that closed the off the space. There were two a/c units, one in the living room and one in the bedroom. Even in the heat of July, we were always kept cool. The bedding and towels were very good quality and the apartment was very clean. Having a full kitchen and washer and dryer for the week was a godsend. We also felt very safe at night. There are several locked doors to go through to get in and one of them is an iron gate. We walked to the subway every day to get into Manhattan. There are two train lines to choose from. It was about a five block walk to the J by taking a left at the end of the street and about a 7 block walk to the AC by taking a right. The ride into Manhattan usually took 25-30 minutes. It would take a little longer if we hit peak times. The owners were very hospitable and helpful. They were kind enough to accommodate our early arrival even though they had a checkout that morning. 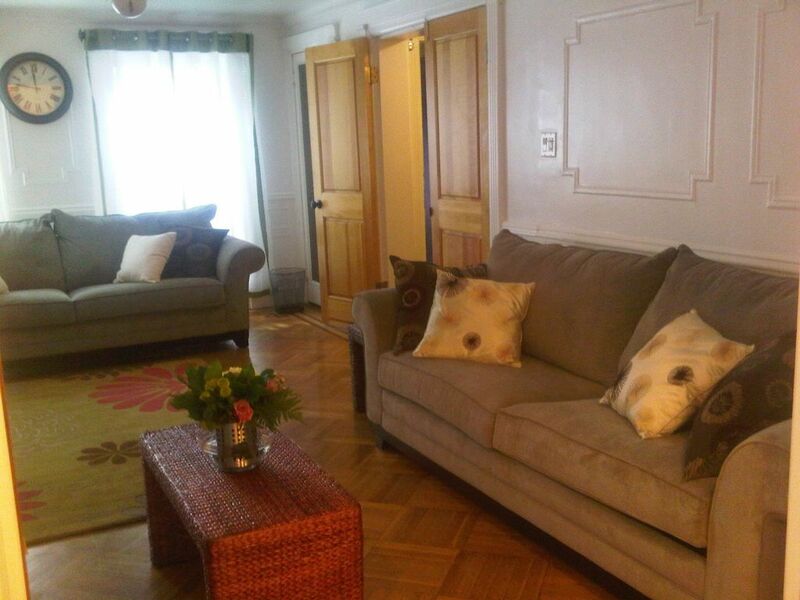 I would recommend this apartment to anyone looking for a clean and affordable value for their NYC adventure. Thank you for choosing our home to enjoy the Brooklyn, NYC experience. It was a pleasure to have you and the teenagers, who were a joy. Thank you again for your candid review, I most appreciate it. Welcome! where peace tranquillity eludes you. The apartment is fully furnished with plush queen sofa beds, flat screen, Internet access TV, microwave, toaster, coffee maker, dishwasher fridge/freezer, utensil, cutlery, and cooking pots/pans. The bedroom with a queen size bed English king, double closet, extra linen, and quilts. The bathroom tub/shower, towels, blow dryer, iron/iron board, laundry room. With use of the patio/garden. The apartment is self contained, and very comfortable. Nestled on a beautiful tree lined block, amongst gorgeous period homes. Bedford Stuyvesant has much to offer the avid traveller, with many connections into Manhattan by the Subway, taxi. Sneak a peek at some of our beautiful churches along the historic rows, and wonder among some of our many tasteful dinning hangouts such as , Mannys a stone throw away, a delight to grab your fresh tea or coffee, or Breakfast on your morning rush into the city. Our local wine store Manny's Wine on Halsey, Grand Champs, on Patchen Ave, Peaches, Saraghina and Bakery all an easy walk too. Check them out too! Not forgetting Peaches hot house, all in Bed Stuy. The Barclay Arena home of the Brooklyn Nets, is closer than you think too! Come and see it all! This city has so much to offer no matter what time of year you come.